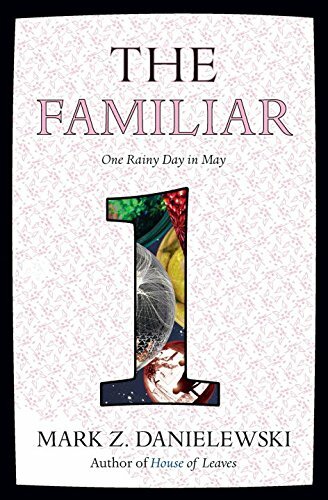 Now that we are several months out from when we first read The Familiar, more information is available about its sequel and the final design of the book. We spent a lot of time interpreting the black and white design elements of the pre-release copy, and it will soon be available in full color with even more interpretations. To the left is the book’s cover, and I think it does a fantastic job of introducing the reader to what they will experience while reading it. Not only does it include a pattern of the margin symbols (which, I believe, we now know are some sort of timeline), but the images within the 1 become less clear the more you look at them. I see what appears to be a dinner plate and centerpiece overlaid by two different kinds of orbs. The one on the left looks especially sic-fi, while the one on the bottom seems to show the functions of the Orb with its warped presentation of human silhouettes in front of the sun or some other source of light. The Amazon page also provides more information about Volume II, Into the Forest, which is set for release on October 27, 2015. This seems like good news for cat lovers, as the cat is presented as the main focus of the series. It is also ominous about what it means that the cat is hungry. The way Xanther found the cat was odd enough, and now I am really curious about what exactly it is hungry for—perhaps the birds we saw in the preview for this book? I’ll be preordering the sequel, and I think the pace at which the books are being released bodes well for those of us who don’t want to be in our 40s (or older) when the final volume is released. Thoughts on the cover design and the hints about Volume Ii? Both Maus and The Familiar are examples of metafiction. However, the way in which these books use metafiction is entirely different. Maus, as an auto-biographical, or at least semi-autobiographical, graphic novel allows for Spiegelman to edit his prose through the eyes of a self-conscious narrator. The narcons, in The Familiar, could also be seen as editors using their own knowledge in order to edit the story, but not in the same way as Spiegelman. Spiegelman’s metafiction, on both the textual and visual level of narrative, shows how an author can become part of his/her own story. Spiegelman, as both author and character, is capable of shifting from narrating the story to lamenting on the difficulty of actually producing the story itself. Spiegelman’s style of metafiction shows how an author can become a part of the story itself, whereas Danielewski uses characters within the story, but outside of the specific narrative, to influence the entire work. Their narration styles are mirror images of each other- We Are All Completely Beside Ourselves follows three main characters, but the work only has a single narrator and limited point-of-view. The Familiar has multiple points-of-view and narrators, but no connected plot. We Are All Completely Beside Ourselves tells the story of three siblings. Rosemary is the only narrator. “…still everything I’ve said is all about them, a chalk outline around the space where they should have been.” This book could have easily been told in multiple points of view, if not from Fern’s POV, then at least Lowell’s. But instead, Fowler decides to keep it only in Rosemary’s POV, which keeps the reader in the unreliability of her mind. The Familiar has nine narrators whose lives do not intersect in any obvious way other than the fact that they all hear an inhuman howl. Because of this, we do not get new perspectives on the same events. This is purposeful, certainly, and if I had to guess, I would say that all these narrators will come together throughout the rest of the series, and that this volume serves as the introduction to them, showing these people at their separate starting points. Despite the fact that the author made radically different choices regarding narration, the reader does not get differing perspectives in either book. While most of the novels we’ve been reading in class this semester have dealt with a human/animal relationship, Maus by Art Spiegelman is the first novel after The Familiar to have strong ties in metafiction. The Familiar is overtly metafictional and it’s plain to see within seconds of opening the book. However, Maus is metafictional is a similar yet different way. The biggest example in Maus is that Art Spiegelman is writing the novel, that he is also a part of, about Artie Spiegelman who seems to still be working out some emotional conflicts. Spiegelman breaks the fourth wall in some sections and the novel refers to itself in some areas. For example, the characters in the novel can be seen discussing the success of the very book of which they are a part. Spiegelman makes us aware that we are reading a graphic novel several times throughout the novel. For example, in one section, he is trying to decide how to illustrate a tin workshop and talks of how he doesn’t like to draw machinery. In fact, there is actually a comic within the graphic novel that Spiegelman illustrated and produced before Maus was published. And in that comic, is a picture of his mother— one of the three individuals in this novel that are presented in actual photographs instead of depicted as animals. Similarly, the Narcons in The Familiar are a part of the story but also exist outside of the story space. The Narcons appear to be in complete control of the narrative, deleting information and commenting on things whenever necessary. Of course, TF-Narcon stands for The Familiar Narrative Construct. So similar to Maus, we get 3 characters that are telling the story that are also a part of the story (or I guess it’s more like they make themselves a part of the story). I am starting to not enjoy this book at all but I am only at the halfway point. I like books that I can read deep into but this is a complete and total mystery. I am really enjoying all the Xanther editions and pushing myself to keep reading further and hopefully finding her again. This whole ordeal of piecing together stories and also keeping them apart from each other is very difficult. I am hoping on every page that I am brought to, I can fully understand but it is not coming to me. To jingjing and the Armenians… “feel like am reading movie” get it? To my surprise I am taking back my statement on January 20th. Now that I have completed this “journey” and have meditated with my class, I am understanding the author, the characters, and why this book is a complete mystery. Yes, we have talked about why literary books are “deeply over read” but in this case (reading The Familiar or any of Danielewski’s books) your mind can wander and think about anything it wants time and time again. Let me clarify: When reading a “regular” literary novel that is written in unmarked text it is simple to understand the meaning of the story. And again, when reading the book a second time, more information may surface. Possibly, when reading a third time, the reader can again pick up on more information. In The Familiar each time the book is read, I feel that new information is everlasting. Every time the text is read, new information will surface time after time after time…. This book is definitely not for the typical reader. It’s special.